Here is a quick of the different permissions that are available with different user roles. Author: An Author has complete access to your projects, releases, themes and templates. Limited Author: A Limited Author has limited access to your projects (to limit an Authors access see here). Reviewer: A Reviewer is able to view projects in Preview mode, add comments, and mark comments as resolved. Limited Reviewer: A Limited Reviewer is able to view and add comments to projects that you have approved (to limit a Reviewers access see here). Analytics only: An ‘Analytics only’ author is allowed to view the Analytics information from your courses and they are able to Comment and use the Review feature, they are not allowed to make edits to content. Layout designer: A Layout Designer is an Author that is allowed to change the layout of your theme using Layout Designer. 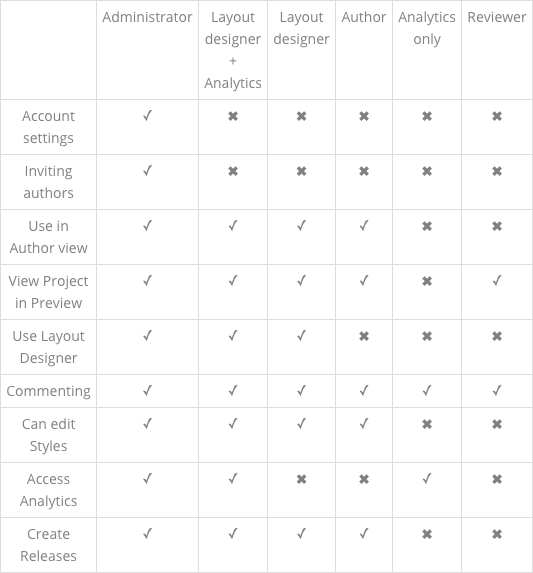 Layout designer + Analytics: A user with this role has access to the features of the 'Analytics only' and 'Layout designer' users. 💡 Pro Tip! Reviewers, Limited Reviewers, and Analytics Only users do not count towards your author limit, add as many as you like! If you would like advice on how to add users to Elucidat, please see here.